As sound waves pass through air, energy is absorbed. This phenomenon is called molecular relaxation because the air molecules absorb energy when they bump each other. The amount of absorption is insignificant at frequencies below 2000 Hz and above 10,000 Hz. However, the effect of air absorption should be included when calculating the total room absorption of large spaces and when sound propagates over great distances outdoors. The curves below show air absorption a(air) in sabins per 1000 ft^3 so be careful to divide the room volume by 1000 ft^3 before multiplying by the a(air), coefficient from the graph. When estimating air absorption for large spaces, use an a(air) of 8 per 1000 ft at 4000 Hz. If thermal conditions are to be precisely con trolled by the HVAC system, use a(air) at the anticipated air temperature and relative humidity conditions. Note: Air absorption is the reason thunder “cracks” when heard up close, but “rumbles” when heard from a distance—the high frequencies are attenuated by the air! It is also why jet aircraft “rumble” when far overhead, yet “screech” at high frequencies when nearby at airports. 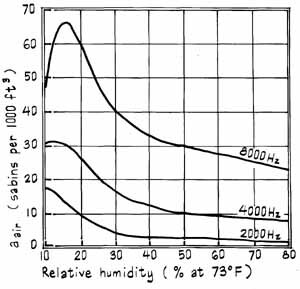 C. M. Harris, “Absorption of Sound in Air versus Humidity and Temperature,” Journal of the Acoustical Society of America, July 1966. The list below presents important acoustical parameters affecting the de sign of multipurpose school auditoriums (e.g., middle and high schools, colleges) with seating capacities in the range of 1000 to 2000. 1. Site: Select a quiet exposure far away from highways, flight paths, or noisy industries. 2. Space Use: Multipurpose uses include lectures, dramas, instrumental recitals, and symphonic music. Consequently, a full-frequency-response sound-reinforcing system will be required. 3. Interior Location: Use corridors, storage rooms, and other “buffer” spaces to isolate the auditorium from noise. Avoid locations adjacent to music rehearsal rooms, mechanical equipment rooms (e.g., don't locate HVAC equipment under the stage), carpentry shops, and other noisy spaces. Enclosing constructions should be based on the principles presented in the next section. For ex ample, all doors to the auditorium should be solid, heavy, and gasketed around their entire perimeters to be airtight when closed. Treat corridors and lobbies with generous amounts of sound-absorbing materials to control noise buildup. Dead spaces tend to induce occupants to speak at lower voice levels. 4. Volume: Volume per seat ratio should be 200 to 240 ft^3 per person, which can be achieved with a room volume less than 500,000 ft^3. The preliminary shape can be based on visual or seating considerations alone. However, to emphasize lateral reflections, plans that are rectangular, roughly square, or only slightly fanned are preferred. Arrange seating to provide the audience with good sight lines (e.g., moderately sloped seating layouts at >7 degrees) and to minimize the distance to the performing area. 5. Reverberation: Use the Sabine equation to determine the reverberation times at 125, 500, and 4000 Hz. This is the formula generally used by acoustical testing laboratories. Published absorption data on most building materials are intended for use in this formula. Be sure to include air absorption, which may be significant at high frequencies in large spaces. The reverberation time T should be 1 .4 to 1 .9 s at mid-frequencies (i.e., average of reverberation at 500 and 1000 Hz), 1.3T at 125 Hz, and 0.8Tat 4000 Hz. At high frequencies, too much reverberation usually means “harsh” or ‘rasping” listening conditions. At low frequencies, too much reverberation usually sounds “boomy,” whereas too little sounds “shrill.” The following general guidelines can be used to select finish materials and furnishings. Ceiling: Use sound-reflecting materials such as concrete, thick wood, or thick gypsum board. However, if required for control of reverberation, the perimeter along both sides and rear can be sound-absorbing (about one-third to one-half of the ceiling area covered in a horseshoe pattern) or use a checkerboard pat tern consisting of alternate areas of sound-absorbing and reflecting materials. Side Walls: Use sound-reflecting and diffusing surfaces with as many irregularities as possible (e.g., sunken panels, splays, and undulations). For variable sound absorption, hang large amounts of fabric curtains or banners along the rear portion of side walls or in cubic volume above suspended sound-reflecting panels. Rear Wall: Use diffusing surface with large-scale irregularities or, if this is not possible, treat with carefully placed deep sound-absorbing finish to control echoes. Floor: Carpet all aisles, except in front of the stage, to aid in footfall impact noise control. Do not use carpet in seating areas. Seating: Use fabric-upholstered seats (never leatherette, thin metal, or plastic). Absorptive seating will help provide “stable” reverberation conditions, so the reverberation will be nearly the same when the auditorium is full as when it's partially occupied. Use seating that does not selectively absorb sound at low frequencies. Continental seating layouts have greater spacing between rows than conventional seating with center aisles. However, continental seating in large auditoriums can present a vast uninterrupted sea of absorptive people to performers on stage. 6. 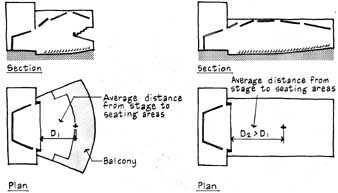 Ray Diagrams: Use ray-diagram analyses to properly orient the ceiling and side walls, especially near the proscenium. Ceiling and wall surfaces should provide useful sound reflections (i.e., early reflections with < 28 ft path difference from direct sound) and diffusion. 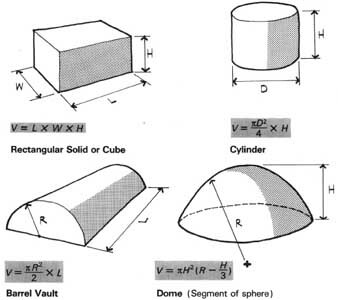 Avoid vaults, domes, and other con cave surface shapes. 7. Background Noise: Background noise should be low so it will not cover up or mask performances. The HVAC system should be designed so its noise will not exceed the preferred noise criteria. Control air velocities at room registers and grilles, and use internal sound-absorbing duct linings and /or mufflers to prevent duct-borne noise transmission in both the supply and return air-distribution systems. 8. Stage Enclosure and Orchestra Pit: Shape to provide good distribution of strong early reflections and diffusion. The reverberation time of the stage house should be approximately equal to that of the auditorium. Reverberation will be longer when surfaces surrounding the stage are shaped to inter-reflect or scatter sound rather than to reflect sound toward the absorptive audience. 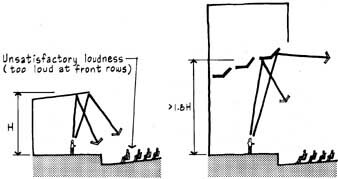 The orchestra pit, sized at about 14 to 16 ft^2 per musician, should have a removable sound-absorbing curtain (or panels) along its rear wall to allow the conductor to control loudness in the pit. 9. Balcony: Use balconies to reduce the distance to the farthest row of seats and /or to increase seating capacity. Keep the overhang shallow (i.e., depth less than twice the opening height), slope the soffit, and treat the face with sound-diffusing elements (or sound-absorbing material) to prevent echoes. 10. Sound-Reinforcing System: Provide a central space just above and slightly in front of the proscenium opening to accommodate a cluster of loudspeakers. Be sure the audience has line of sight to the high-frequency horns of the cluster. Locate the control console for the sound system at a central location in the audience seating area. A far less effective alternative location is the rear of auditorium in a separate room which can be opened to allow the operator to attempt to hear the sound being controlled. 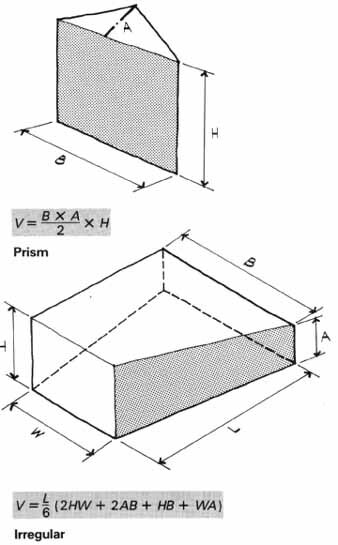 Because reverberation time is directly proportional to the size of a room, it's extremely important that cubic volume be correctly computed. For example, if cubic volume is x percent in error, predicted reverberation time would be a corresponding x percent in error. For most situations, a change of 10 percent or more in reverberation can be detected by listeners. Volume of rooms that are cubic or rectangular solid in shape can be readily computed by multiplying length times width times height. 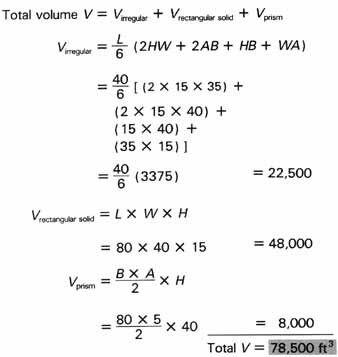 Shown below are volume formulas for several regular and irregular shaped rooms. In many designs, it's best to subdivide room volume into smaller volumes, such as in an auditorium: main hall, orchestra pit, under balcony, above balcony, and so on. The resulting total should be far more accurate than an estimate based on average overall dimensions of length, width, and height. 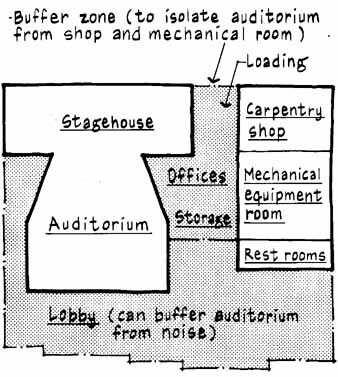 A classroom/small theater is described by the plan and section drawings below. Find the total cubic volume V in this room. 2. Compute cubic volume for each volume using formulas from preceding pages. 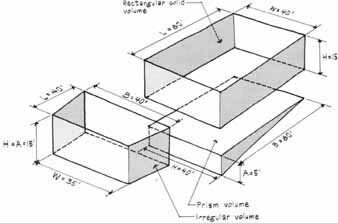 Total cubic volume is sum of three sub-volumes.